Go to this website, pick a material, send in an audio file. 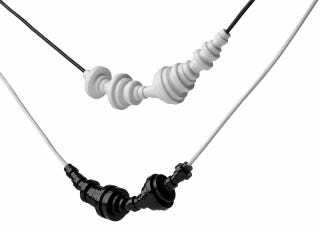 Get back jewelry in shape of the sound wave you gave them. It's simple, and oddly beautiful. Bza.biz offers all sorts of materials and sizes for you to choose from. The shapes are made from the arrangement of differently diametered disks to recreate your sound wave. You can get plywood disks in either 1 or 1.5 mm thicknesses, 1.5 mm black plywood, 3 mm acrylic (in black, red, white, and "radiant/rainbow"), and 1 mm blue acrylic. You can also choose between rubber and leather (and a number of colors) for the string. Or, if the disks aren't your style, you can get 3D printed silver earrings or metal keychains. Honestly, the hardest part is deciding on the message to make.